Caprice Parkes and Joe Singh’s rustic lifestyle is very different to the life they left behind…and they love it. The couple lives in Chan Chen Village, in Belize’s northern Corozal District, abutting Mexico. Young “retirees” at only 43 and 45, Caprice and Joe actively work a 22-acre homestead, and are largely self-sufficient. Caprice hails from the small town of Holberg, British Columbia. Her husband Joe comes originally from Fiji, but migrated to Canada in 1996. Before they moved to Belize, they lived in Vancouver where they both worked in the frenetic industry of logistics/freight forwarding. So how did this 180-degree transformation occur? Caprice learned about Belize through her mother and stepfather, master scuba divers who were both diving Belize’s reefs before it became so well known and popular. It was the first she’d ever heard of this tiny country. Caprice recalls there was “no internet then—I had to look it up on a world map.” The seed of interest was planted. The couple made a scouting trip to Belize on a vacation. They met a real estate agent who showed them several properties, including the one they now own. It was love at first sight. “We looked at a lot of properties but came back to our little piece of heaven,” Caprice says. New home chosen, they started to make a move. Like the settlers who came before them, Caprice and Joe loaded their possessions onto a wagon—except that this time it was a 1976 RV named “Lola.” During a three-month odyssey, they drove down through the U.S. and Mexico to arrive at their new home. They left a lot behind—not that they saw that as a bad thing. It helped to check them out of the stress of the busy lives they left behind in Vancouver. There were “no more weekend cell calls to make sure someone got the shipment, no more being on call 24 hours a day, and no more ‘Hey can you take care of this even though you are on vacation,'” Caprice says. It was a relief. Where, Caprice says, their life had been “just existing to work for others,” they could now try to build something for themselves. And build something they have—a working farm that they’re proud of. When Caprice and Joe need a break from their farm in Corozal, they vacation on the nearby Caribbean Island of Caye Caulker. During their nearly four years in Belize, Caprice and Joe have met many locals and expats. The locals have been welcoming. Sure, the area might not offer opera or world-class ballet, but the couple finds some more novel entertainment. “At about 6 a.m., our turkeys give us a dance,” jokes Caprice. Still, there are more traditional forms of entertainment, too! There are dart games at the local hangout and barbecues and potluck dinners with friends. There’s also a local House of Culture, and monthly Art in the Park displays. 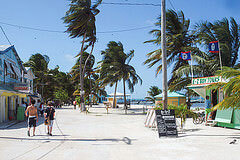 Sometimes the couple travel out to the small island of Caye Caulker for a bit of vacation. But most days, life centers around the farm, which they named Crooked Tree Ranch, in honor of the tree marking its entrance. They lead an active, independent, and healthy lifestyle. The couple also finds time to run a small property management and grounds maintenance business. And they’ve built a basic apartment for rent. The daily tariff is only $15, which includes a breakfast of stuffed fry jacks (beans and eggs), French toast, pancakes, and oatmeal topped off with honey from the farm. 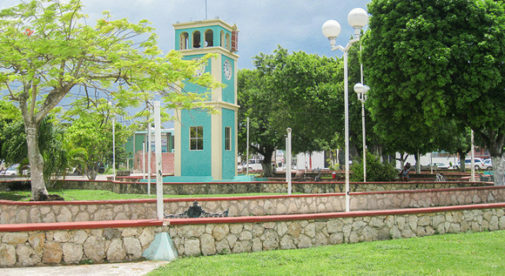 Should you find yourself in northern Belize, be sure to drop by.